South Africa is pretty lucky when it comes to our abundant marine life and the various species we encounter here. Some only provide rare sightings but we can still boast that 11,130 different species of marine animals inhabit our shores. 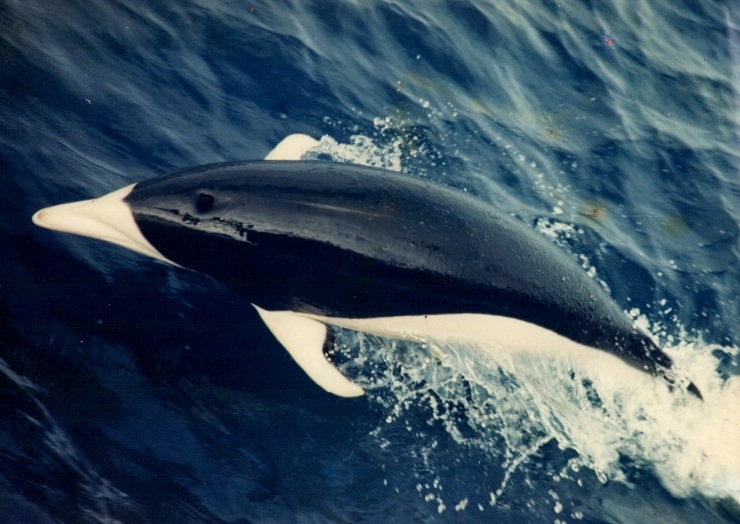 One of the most infrequent visitors is the Southern right-whale dolphin (Lissodelphis peronii), an unusual looking cetacean which cannot be mistaken for any other! 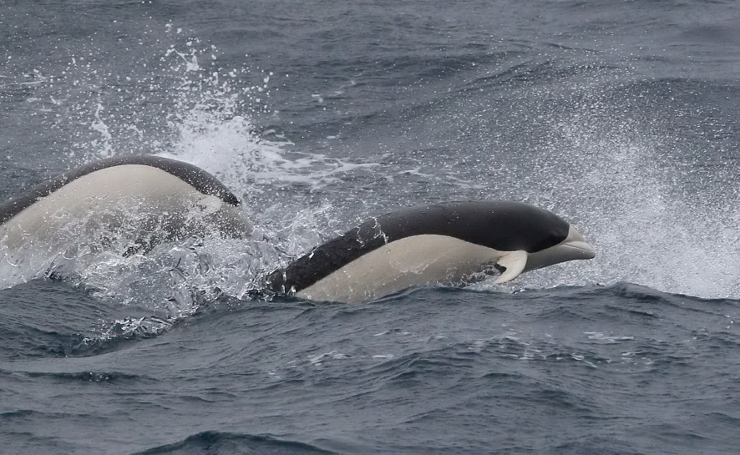 These unique dolphins, reaching no more than 3 metres in length, are found in the cool waters of the Southern hemisphere, and are the only dolphins without a dorsal fin in this region. This, along with their pure black and white colouration, makes them very easy to identify. There are usually less than a hundred in a pod, but they have been observed in groups of up to a thousand animals, and even in mega pods with other species, including pilot whales and dusky dolphins. They are energetic and fast swimmers, and only ever seem to be observed in this regard; travelling at speed (up to 40km/h), as little is known about other behaviours. Although this species has been spotted a few times off the coast of Namibia, it had only been seen in South African waters once, just south of the Orange River. The first of the attached photos was taken by Willie Hennop aboard the sailing vessel “Mieke” off Luderitz in 2001. The most recent sighting was by Professor Peter Ryan from the Percy Fitzpatrick Institute at the University of Cape Town. He was on his way back from field trip on Tristan De Cunha Island last month when he saw them from the ship. He managed to take the attached photo. Due to their preference for deep, oceanic waters not much is known about these dolphins and they are listed by the IUCN as data deficient. It is known that these creatures have been hunted for their meat in areas around Peru and Chile. They are probably threatened by fisheries due to bycatch in fishing gear. We hope that the population is not at risk and we will continue to see them throughout the Southern oceans!